Big Shoals State Park features the largest whitewater rapids in Florida. Limestone bluffs, towering 80 feet above the banks of the Suwannee River, afford outstanding vistas not found anywhere else in Florida. When the water level on the Suwannee River is between 59 and 61 feet above mean sea level, the Big Shoals rapids earn a Class III Whitewater classification, attracting thrill-seeking canoe and kayak enthusiasts. Over 28 miles of wooded trails provide opportunities for hiking, biking, horseback riding and wildlife viewing. 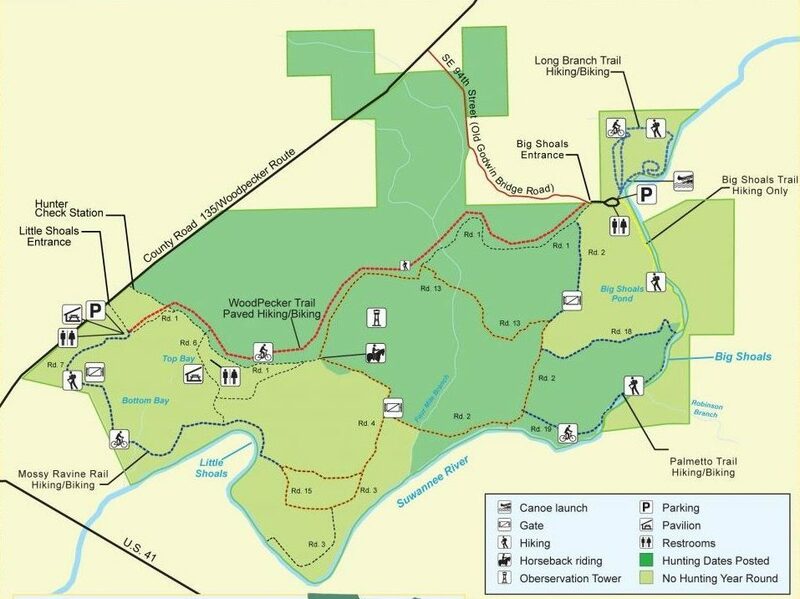 Visitors who wish to view the Big Shoals rapids should park at the Big Shoals parking area and hike approximately 1 mile on the Big Shoals hiking trail (Yellow Blaze trail). There is no vehicle access to either the Big Shoals or Little Shoals rapids. The best way to access Little Shoals rapids is to enter the park through the Little Shoals entrance, drive down road 1 and turn right on road 6. Drive to the end of road 6 where you will park your vehicle and hike approximately 1/2 mile down the Mossy Ravine trail (Blue Blaze trail) until you see the sign for Little Shoals. The Woodpecker Trail, a 3.4-mile long multipurpose paved trail, connects the Little Shoals and Big Shoals entrances to the park. The river offers excellent opportunities for freshwater fishing. A picnic pavilion that seats up to 40 people is available at the Little Shoals entrance.